Aired in Spain last week. Figured out how to show the video straight from the blog. Enjoy! Aired in Spain last week. 6 players down to h/u. Having trouble with the first link, just copy and paste. I have played a few interesting hands in the past three episodes, all of which I may do a write-up on if I get bored. I am also planning on writing something about the main event from this year – even though it was a short tournament for me, I still played a number of interesting hands. Well, I’m officially in Chapel Hill. Today is my first day of ASW II, the summer program that over 80% of my incoming class attends. I am looking forward to meeting my classmates, but I can’t believe that I am headed back to class. It is surreal. As of right now, I know not a soul out here. My apt. still has no furniture (the movers plan to bring my stuff sometime this week from Chicago) and my car has yet to arrive. It’s easy to second-guess yourself in a time like this – did I make the right decision going back to school for my MBA? Was UNC the right decision? At the end of the day, I hope this is all just nerves. I’m sure that once I get into the swing of things, I will be happy as a clam (whatever that means). I guess poker is no longer my day job. Hmm. Still deciding if I plan to update my blog past those last few hand reviews I promised. I guess we’ll just have to wait and see. GL to all my friends still in the main event. gogogogogogo. Idiot kid from Texas has 3bet me twice during the level. I open ak ss from hijack he 3bets I 4bet he jams I call for 40kish pot. He has aq dd and goes I guess u got me. Lol. Flop is kjt dd. Ha gg. What a joke. Did some work. Up to 25500. On dinner break now. Chipotlements! Haven’t won any substantial pots but managed to lose a bunch. I have 15k going into 3rd level. Want to punch the Brazilian sitting next to me. Tomorrow begins my 2010 main event journey. 30k starting stack means 300bb during the first level. I’ll be posting as much as I can via my iphone during breaks and whatnot. My roommate Joe got 8th in the 2500 event that ended today. We were at the Rio late last night to sweat both him and Craig (Craig bubbled the final table) and then today. Really happy for Joe but I’m sure he was looking for a 1st. 78k isn’t terrible, but when 1st is 860k (and a bracelet), it hurts. Still a nice showing – good job Joseph! One of the softest fields of the year, but I wasn’t gifted many chips or many spots. Best hand I saw in 8hrs was JJ so I was forced to make things happen. Apparently it was not enough. Today is an off day, tomorrow is 4th of July and then we start the big mama. I’m going to register for day 1B, which means I will be playing on Tuesday. Happy 4th of July Weekend. 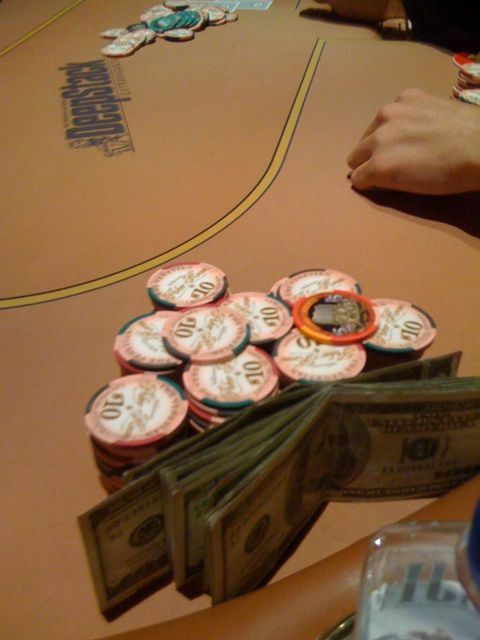 Soon enough, poker will no longer be my day job – scary! Sorry, I’ve bee MIA the past few days. Jess was in town and I was trying to make the most of our time together. I played a few events while she was here, but bricked everything. We went to Surrender and XS, two clubs in the Wynn on Saturday and Monday, respectively. Both clubs were absolutely amazing – I suggest that anyone who comes to Vegas makes sure they go to at least one. They are indoor/outdoor venues, which is how Vegas clubs should be, in my opinion. It’s too hot outside to miss incorporating the weather into the club scene. What better way to celebrate a night out than to get a table that is also a bungalow with its own private flat screen TV, misters and balcony? Yesterday was my birthday – I want to thank everyone that contacted me. I was somewhat unavailable as I was playing the Venetian Deep Stack 2k all day, but I was aware of all the phone calls, texts and facebook messages that were left on my phone. It’s tough when you are at the table and receive a call. I try not to break my concentration over and over again by leaving the table. But, I really appreciate all the support. Thanks guys! I made day 2 of the Venetian Deep Stack which starts at 4PM today. There are still 90ish players left, with around 50 cashing. I’m somewhat short with 20bb, but it’s not unfamiliar territory, by any means. The way I see it, we still have 30 minutes of the current level (where I have 20bb) and then the blinds move a little to where I have 15ish (which is still plenty when you are playing live). So, I have some time to make a move. My roommate, Ryan, my horse, Jack, and my friend, Allen, are all still in the event, so hopefully I can make a deep run with them.